Home › Kickstarter › My Knee Jerk Reaction is to Use “Knee Jerk” in this Headline. That’s One Point for Me. My Knee Jerk Reaction is to Use “Knee Jerk” in this Headline. That’s One Point for Me. Whomever comes up with an answer first, gets a point. There are more than 150,000 more of these funny, surprising and often thought-provoking scenes just waiting to be uncovered in a power-packed deck of just 55 cards. How is this possible? Each card contains three sections — a beginning of a sentence, a middle, and an (almost) ending. 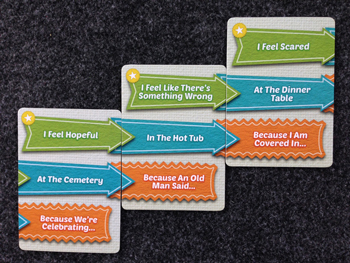 The host, or person running the game, sets up the game and the scene by drawing two cards and arranging them so that top of one card aligns with the middle of the second card, establishing the start of a sentence. The host simply reads the cards aloud, and the players let loose with their fastest, often hilarious, and hopefully pertinent answers. Then the host draws three cards to form a hand. He chooses one to be added as the third card, setting up the nearly-complete sentence and impending knee-jerk reactions from the players. The host simply reads the cards aloud, and the players let loose with their fastest, often hilarious, and hopefully pertinent answers. If an answer doesn’t make sense, the host explains his reasoning, and waits for a new reaction. A point is awarded to the quickest reply that fits, and the the left-most card in the line (the start of the sentence) is given to the player as a point. What remains on the table is the first two cards of a whole new sentence. The host draws a new card into his hand, and again lays down a third card, forming another engaging situation that begs for a proper ending. The first player to score 4 points (or 3 points for larger games) wins! The rapid fire game play that has the host laying down a single card in a chain to continue the game means that rounds proceed very quickly. This is an aspect of Knee Jerk that we really enjoyed. Everyone was always in engaged in playing the game, and upon awarding a point, the next challenge was a mere seconds away. I can’t stress to you enough how much fun we had playing this simple, creative card game. The surest sign that Knee Jerk will be making it to our table again very soon was when a friend asked that we pull the game out a second time during a recent game night. I won’t say what game we played in between, but several friends wanted this brought back to the table immediately! No one objected. The clever design, quick game play, and creative scenes that evolve across the innovative card structure are the recipe for a highly enjoyable, and often hilarious evening with friends. Knee Jerk has a forward momentum that I don’t often experience in party games, and this keeps the action and fun zipping along for as long as your sides can handle all the laughing.